A smile is often the most eye-catching feature of a face. With dentistry’s many advances, you no longer have to settle for stained, chipped, or misshapen teeth. You now have choices that can help you smile with confidence. Even the most subtle change in your smile can make a dramatic difference in the way you look and feel about yourself. Talk to Dr. Mike or Dr. Tina Cox about the options most suitable for you, what your expectations are and the dental fees involved. Tooth whitening is effective in removing some or all of the internal tooth discolorations due to congenital, systemic, pharmacologic, traumatic, etc., factors and aging. Teeth remain lighter for years. We use Opalescence Take Home Whitening Gel. It is only available from a dentist. We will supervise your treatment from initial consultation through completion. The sticky, viscous gel won’t migrate to gums. We choose the formulation that includes Potassium Fluoride, which helps to improve oral health by strengthening enamel, decreasing sensitivity, and offering increased cavity prevention. Powerful, prescription-strength Opalescence Take Home Whitening Gels are available in two strengths. These Whitening Gels can provide results after just one night. You can expect to see significant results in the first week though we recommend treatment for 2-3 weeks for optimum results. Teeth Whitening treatments are delivered via customized bleaching tray. We will create this tray from an alginate impression of your mouth; this customization is part of why our tooth whitening treatments are so effective. Composite bonding is one of the most conservative, versatile, and affordable ways to esthetically restore a multitude of dental cases. This material is used to restore cavities in front & back teeth, replace old or unattractive “silver fillings”, repair root abrasion – helping prevent cavities, reduce sensitivity, and improve appearance. Unlike “silver fillings” that depend on undercuts to hold them in place, composite bonding adheres to the tooth itself. 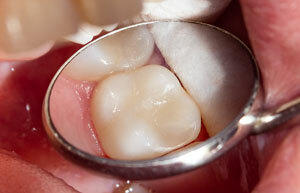 Only a small amount of natural tooth (as well as any decay) need be removed in order to place a tooth colored filling. Also referred to as ceramic restorations, porcelain restorations are used as inlays, onlays, crowns and aesthetic veneers. Dental materials include porcelain, ceramic or glasslike fillings. Veneers are thin custom-made shells designed to cover the front side of teeth. Veneers are used to close spaces between teeth and treat teeth that are chipped or worn, permanently stained, poorly shaped or slightly crooked. Crowns cover your teeth to restore your natural, youthful smile. They can improve your smile by changing the color, size, shape, and position of your teeth. Bridges replace lost or missing teeth by using the teeth on each side of the space for support giving you a beautiful, well-balanced smile and preventing shifting and damage to your bite. Crown and bridge treatment will replace lost or missing teeth, support remaining teeth and help you maintain optimum dental heath. This long-term solution can help prevent the cycle of problems that can occur when just one tooth is missing, such as shifting of the remaining teeth, decay, periodontal disease and bone loss.